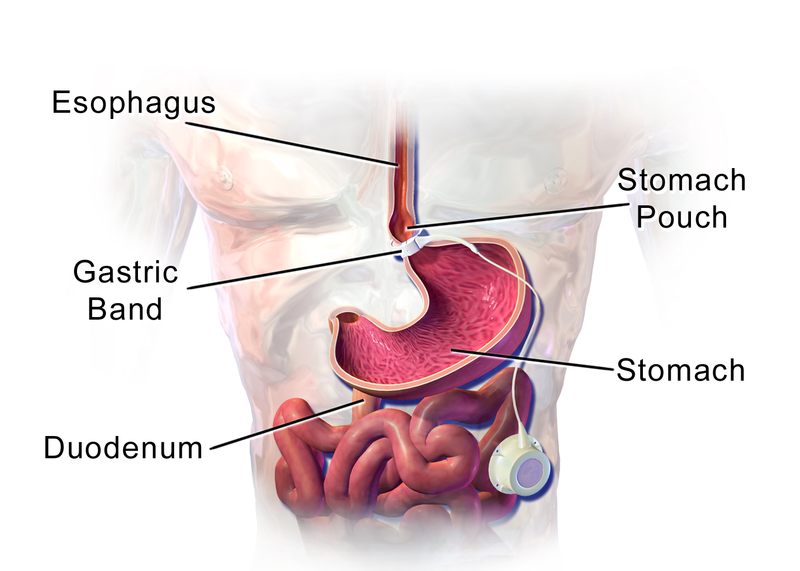 A gastric band procedure primarily works via a restrictive mechanism. The pars lucida and greater omentum are dissected and a restrictive band is placed around the stomach. It is usually performed as day-case procedure. It is a lesser physiological insult than the other bariatric operations, and so its initial complications are less. However, the degree of weight loss generated is believed to be less and a substantial proportion of patients develop band slippage or erosion, and may require further surgery (either band removal or conversion to sleeve / bypass). Haemorrhage Damage to any of the surrounding structures can cause significant haemorrhage. Injury to surrounding structures including bowel, liver and spleen Damage can occur to any surrounding organ during the surgery. Blood clots DVTs and PEs are a possibility in any operation. The risk is increased in patients with a raised BMI, on the pill, recent flights, previous DVT, pregnancy, smokers, cancer, and prolonged bed rest. The patient will be given anti-embolism stocking and low molecular weight heparin peri-operatively to minimise this risk as deemed appropriate. Failure to lose weight or weight regain Sleeve gastrectomy is highly effective, but inevitably a minority of patients ultimately fail to lose or regain weight. Band slippage (1 in 20) If the band position slips, this can become a surgical emergency as this can lead to ischaemia of the stomach; this often requires urgent surgical removal of the band. Band erosion (up to 1 in 100) The band can erode into the stomach; treatment can involve simple laparoscopic excision of the band to laparotomy or even (rarely) partial gastrectomy. Injection port and tubing related problems (1 in 20) As with any foreign body, the tube and port can become infected.